Russell Westbrook collected the pass then started to make his move as Paul George hurtled into view. Slipping out of a screen he pretended to set, George suddenly popped open, and Westbrook, quick as can be, darted the ball to him. George rose and fired, the shot was made and so was history. Some NBA players have historic nights. The way Westbrook simply plays the game is itself historic. George’s three-pointer with 3:52 remaining put his teammate and “brother” Westbrook over the top in the record books, breaking Wilt Chamberlain’s 51-year-old record as he recorded his 10th-consecutive triple-double. Westbrook racked up 21 points, 14 rebounds and 11 assists in the game, including 6 fourth quarter assists as the Thunder never trailed after the second possession of the game in a 120-111 victory over the Portland Trail Blazers. Westbrook was sensational in the fourth quarter, leading the Thunder to just one turnover in the period when it shot 13-for-22 from the field and clinched the season series by going up 3-0 against Portland so far this season. The intensity brewed from the Thunder’s side at the very outset of this one, cultivated as always by Westbrook whose focused fire burned bright in this divisional matchup. Triple-doubles were traded in this game, as Westbrook returned the favor to clinch George’s first triple-double since 2014 on a catch-and-shoot three-pointer with 51.8 seconds remaining. After the shot went down, Westbrook and George sought each other out for a mid-air side bump, with smiles beaming at mid-court. George finished the game with 12 rebounds and 10 assists while racking up those 47 points on 15-of-26 shooting, including an 8-of-13 mark from the three-point line. All night long, George was relentless in his attack, slashing downhill into the lane, giving the ball up when double teamed and dancing behind screens for three-pointers. It wasn’t just the Westbrook and George show, however. In fact, without a pair of reserves, the Thunder likely would have dropped this one. 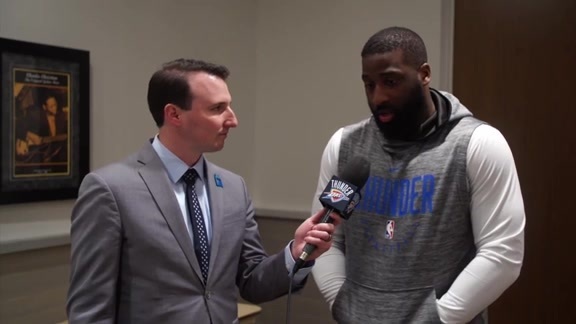 With both Jerami Grant (ankle) and Dennis Schröder (personal) unavailable tonight, the Thunder leaned on reserve veteran point guard Raymond Felton, who hadn’t played since Dec. 30 and rookie two-way player Deonte Burton. Both showed out and evidenced the culture that has been cultivated in this Thunder locker room. 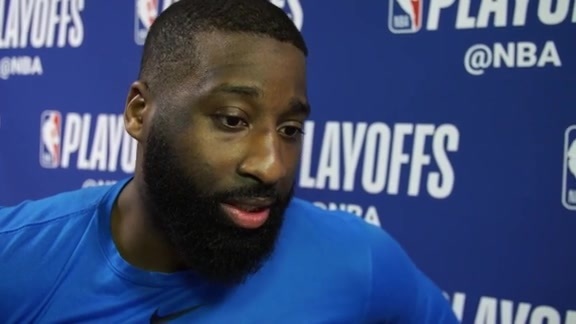 Players can come out and give 20-plus minutes out of the blue like Felton and Burton did tonight, but it’s very rare in locker rooms for players to feel empowered to come in and brim with supreme confidence for each of those minutes. Playing completely freely, Felton racked up 15 points on 6-of-10 shooting and Burton, who played closing minutes in crunch time, added 18 points on 7-of-9 shooting. Both players started their nights 3-of-3 from the three-point line and were given opportunities to both convert catch-and-shoots and score off the dribble. What propelled the Thunder from the very outset, however, was the defense. Head Coach Billy Donovan’s club held Portland to a 1-of-5 shooting start to quickly take a 10-4 lead, then finished off the first quarter on a 13-4 burst. Smothering guards Damian Lillard and C.J. McCollum and preventing shooting pockets, driving lanes and passing angles, the Thunder made deflections, disrupted rhythm and forced Portland to try to score 1-on-1. The result was 0-for-15 shooting on non-paint two’ for Portland, and 41.4 percent shooting overall in the game as the Thunder also blitzed the Blazers 23-10 in fast break points. Over the years, Oklahoma City has seen a lot. Great basketball, outright competitiveness, brotherhood and historic milestones. Tonight was a brilliant confluence of every one of those factors that has created the Thunder’s secret sauce. It was one of those nights that makes fans proud to be an Oklahoman, honored to be in the building, and motivated to have their guys’ backs.